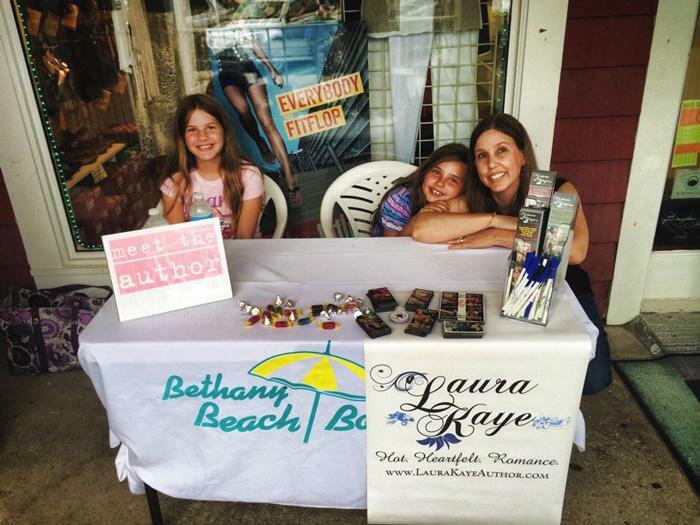 Laura Kamoie '92 took time out over the summer to do a book-signing event (with her kids) during a beach vacation. Photo courtesy of Brian Kamoie '93. Laura Kamoie ’92 was recently driving with a friend to her own birthday party when her phone rang. It was her editor, and she was calling to tell Kamoie that her new book, Hard to Hold on To, debuted at No. 8 on the New York Times bestseller list. While Kamoie, who writes under the name Laura Kaye, has had a lot of success across her 17 books, this was clearly a big deal. She thinks the book’s No. 8 spot might have something to do with her main character and his place in what she describes as a current epidemic. Kamoie retired from teaching history at the United States Naval Academy at the end of 2013 to focus full time on her fiction writing (her 18th novel, Hard to Come By, comes out in November). But she recently switched artistic gears and tapped her academic roots, writing a historical fiction novel called America’s First Daughter, which will be published in 2016. To Kamoie, those things aren’t as different as they may seem. "Silver Linings and Wooden Stakes"